The Neoclassical edifice of the library was built in the years 1822-1829, most probably according to a design by French architects Charles Perciere and Pierre- François Leonard Fontain. The front façade is reminiscent of the east façade of the Louvre and features 12 pairs of imposing cast-iron Corinthian columns. It was the first building in Poland built solely for the purpose of housing book collections and the first Polish public library. Opened on 5 May 1829, the library was founded by Count Edward Raczyński who also provided it with several thousand volumes. In accordance with the foundation statute, the library became the property of the city. The historian Józef Łukaszewicz was appointed the first librarian of the institution. During Prussian rule the library became the bastion and symbol of Polish culture and the book collection was "accessible to everyone on an equal basis". Today, the Edward Raczyński Municipal Public Library is the second largest library in Poznań (after the University Library). The special collections contain over 9,000 manuscripts (including 100 papyri), nearly 18,000 old prints (including c. 250 incunabula) and around 10,000 maps and charts. Worthy of mention are: a manuscript of a codex from 1460 that includes theological treatises by Augustinus Triumphus of Ancona, Old Polish prints by Stanisław Hozjusz (1533), Łukasz Górnicki (1566) and Mikołaj Rej (1568), printing matters from Melchior Nehring's publishing house (1577) and the Jesuit printing house in Poznań (17th -18th centuries). 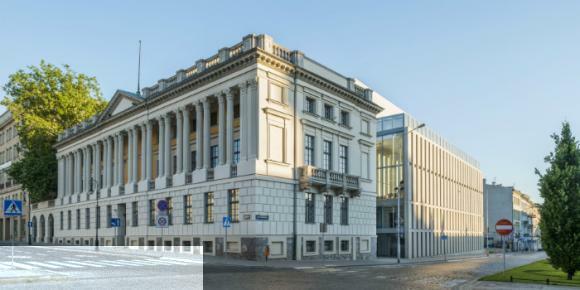 The library has established an extensive network of branches throughout the city and it runs three literary museums (devoted to Ignacy Kraszewski, Henryk Sienkiewicz and Kazimiera Iłłakowiczówna) and a memorial room commemorating the local marine writer Jerzy Pertek.